If you like killing slimes, you're in luck - they aren't going anywhere. August 2 marked the Japanese release of the latest Dragon Quest title, the tenth in the series. The Wii MMORPG, published by Square Enix, is not only the first game in main series developed for the Wii, but also the core series' first foray into the MMO market. 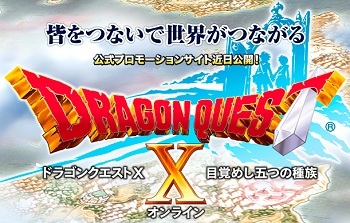 Though some fans are concerned about bringing the traditionally single-player franchise online, Square Enix has some ideas to keep the game from getting stale: the publisher has announced plans to keep Dragon Quest X supported with content updates for ten years. Japanese newspaper Nikkei reports that "major version up revisions" will be coming to the game every ten weeks. Square Enix hopes to keep this update schedule in place all the way to 2022, which would be no small feat. Doable, certainly - EverQuest is still getting new content, and it was released in 1999 - but in the competitive market of modern MMOs, it's a long time to keep a game alive. Producer Yosuke Saito has said that in addition to these updates, the game will be supported with weekly updates following launch. These content patches will include new quests and story segments (presumably alongside standard MMO tweaks and bug fixes). The ten-week interval updates will be larger scale, including things like new gameplay elements. It's an ambitious goal, but given the immense popularity of the Dragon Quest franchise, particularly in Japan, Square Enix is in a pretty good position to follow through with its promise. As for whether or not the audience will still be there to appreciate it, well, that may be a different story. With so many MMOs struggling to keep players interested after the free thirty days, planning so far ahead might just be a bit excessive. Whatever new content Square Enix has planned, it had better be good if it's going to drag us away from our hoverboards and holodecks. Dragon Quest X grants players two hours of play time each day for free, but requires a monthly subscription fee of about $13 to play more than that. It is currently available in Japan on the Wii, with plans to release on the Wii U later on.